An exhibition at the Design Museum challenges some of the most exciting talent in contemporary design to explore, in the medium of crystal, the future of memory in the fast developing digital age. “Over the past decade Swarovski’s design and architecture commissions have served as an important experimental platform for leading figures in design to conceptualise, develop and share their most radical ideas. For this exhibition, the Design Museum and Swarovski are collaborating to challenge designers to explore the future of memory in the fast developing digital age. The result is 15 unique installations giving you a glimpse of the future of memory”. Crystal as a “growing” material offers an interesting aspects for the design. How to apply the idea of memory into it? The exhibition shows a fantastic variety how different designers have answered the brief. 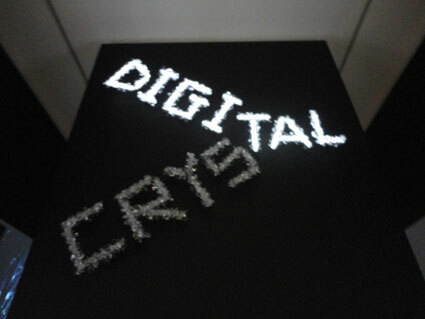 One of the many highlights is the halogram table which is the crystal totally immaterialised. Swarovski has always been inventive and looking into the future how to adapt their products accordingly when the world is changing. Immaterialism is always related to digitisation. The exhibition offers some answers not only how to immaterialise crystal in the digital age but also how to materialise the immaterial.